5 Studies Showing why Reading is Healthy! If you’re a book worm, no tablet can take the place of the wonderful tactile experience of reading a good book. 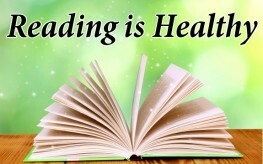 Whether you like novels or history books, books on great leaders or nutrition, reading is an extremely healthy habit. Sadly, however, many people don’t appreciate it, with a HuffPost poll showing last year that of 1,000 participants, 28% of those surveyed hadn’t read a book in over a year. Below are just 5 studies showing how beneficial reading can really be for your health. It’s not too late to get back into reading. The best part about reading into adulthood—you don’t have to write a report or be prepared for a discussion, you can just do it for fun. 1. Improved Social Skills – One recent study, published in the journal Science¸ found that reading could improve your ability to read the thoughts and feelings of others. In this way, reading books can affect your social abilities. The researchers found those who read more literary books were better able to read the emotions of people by looking at their faces. 2. Protection Against Alzheimer’s – Several years ago, scientists said those who read may be less likely to suffer from Alzheimer’s in old age. Initially published in the Proceedings of the National Academy of Sciences in 2001, the study found older adults who kept their brains engaged with activities like reading and playing games were less likely to suffer from the degenerative brain disorder. 3. Reducing Depression – Some books even have the power to reduce depression. This year in PLOS One, a study was published indicating patients who combined support sessions with reading self-help books showed lower level of depression than patients who only received traditional treatments. 4. Combating Stress – Reading can also reduce stress levels. Researchers with the University of Sussex found that reading was the “most effective way to overcome stress,” according to Huffington Post, more effective than listening to music, having a cup of tea, or even going for a walk. 5. Staving Off Mental Decline – Finally, reading can keep you sharp. It isn’t only because you might be loading up on new knowledge in your books, but elderly people who read experienced slower mental decline than those who didn’t. Those who engaged in infrequent mental activity exhibited mental decline 48% faster than the control group, however. Reading isn’t only fun, it’s good for you. And reading for pleasure is something that not enough people take the time out to do. Add this to your health regimen and experience the benefits yourself. How is that possible?? Oh yeah – fags.